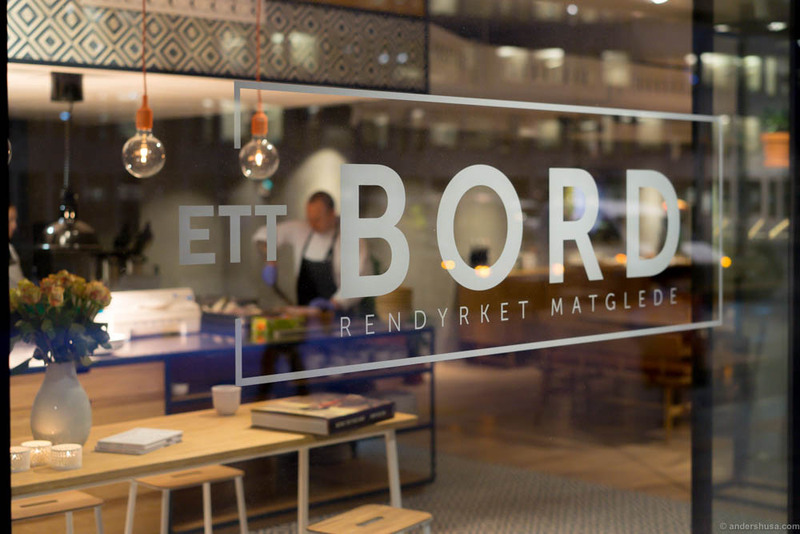 Ett Bord just opened at Vikaterrassen in Oslo, and they offer exactly what their name suggests – just one huge table that can fit 24 people. A quick google search will tell you it isn’t the first restaurant of this kind, but I’ve certainly not seen one before. Ett Bord is social dining taken to the extreme. 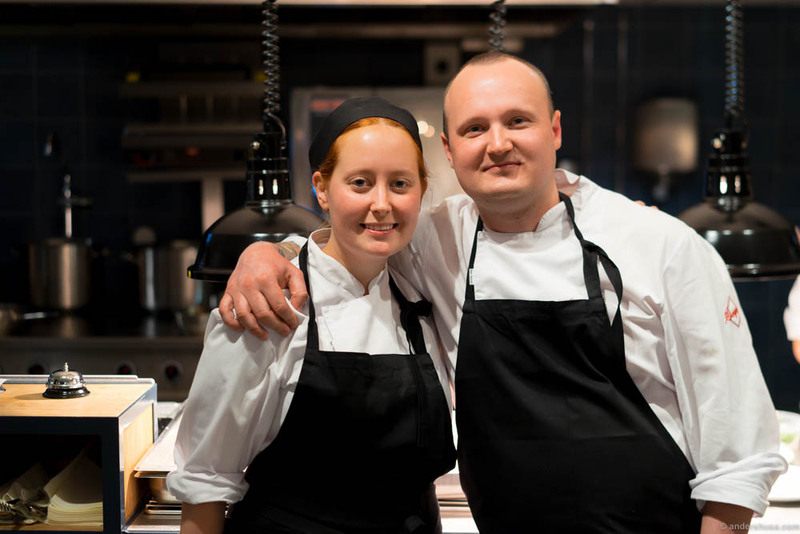 In the kitchen, head chef Axel Nordahl and sous chef Sanna Jakobsson are cooking up casual, modern, Nordic food with local, seasonal and organic ingredients. 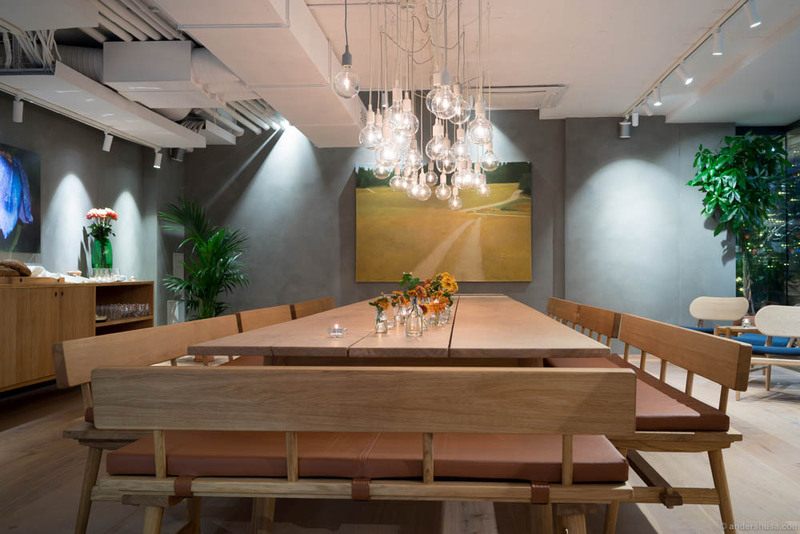 I asked the owner of Ett Bord, Carl Johan Bahre, how he plans to run a restaurant like this in Norway – the country where everyone prefer to have a seat row of their own when travelling with public transportation. “You’d be surprised how social people get around this table,” he told me. “Also, we try to seat people next to each other, but we won’t force them.” As the table started filling up we noticed people chose a corner each – as expected. Mind you, this was early in the evening and the alcohol level was low. Probably things will work out just like they do on the bus: once the corners are filled up, the rest will be forced to sit next to someone and they’ll be fine with that. They might even start talking. That’s what happened at the IKEA Ätbar for sure! The tartare set the standard straight away. Axel Nordahl knows what he’s doing. 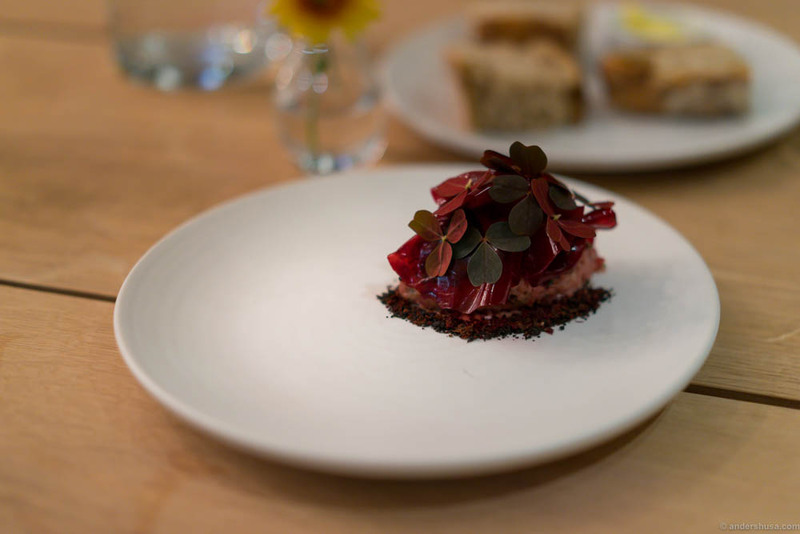 Beef sirloin mixed with the oil from the peel of black garlic, shallots, chives and salt, served with a paper-thin sheet of redbeet gel from reduced beet juice, a crumble of black garlic and dried beet meat, black garlic mayo and red oxalis. Boom! Fresh, acidic and packed with umami flavor. An elegant presentation that reveals a lot about Nordahl’s technical skills and his ability to balance flavors and textures. “Was it good?” the humble chef asked after we finished. No, it was great! Next up was the main dish of flaky pike perch with a sweet sauce of romano salad. It was served with potatoes in butter, smoked mussels, romano salad, samphire and turnip kale. Topped with a winged kelp powder. One of the best uses of seaweed that I’ve experienced – it actually added a lot to the dish. A hearty and rustic serving, where each element played a significant role. The earthiness of the potatoes combined with the smoked flavor of the musssels and the kelp powder added umami, the salad and turnip gave it a sweet element and the salt and richness came from the butter and samphire. “Anything you didn’t like?” Nordahl asked. Sorry chef, I loved it. It’s just what I needed on a cold winter evening. 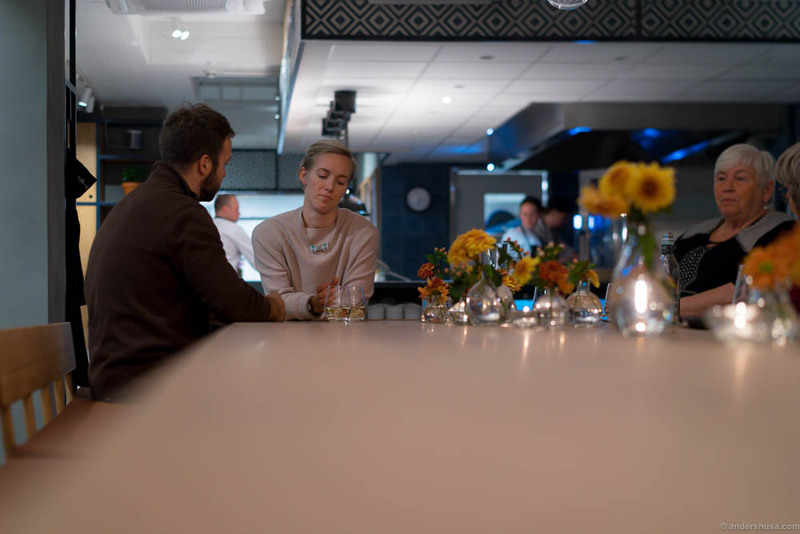 When I was invited to try the menu at Ett Bord I answered like I always do: I am happy to test and give my feedback, but I won’t necessarily publish anything. My concept is all about recommendations. I write about the places I want others to try. Well, you’re reading this now – I easily recommend to give Ett Bord a try. It’s simple and delicous Nordic food. We ended with a dessert called “Et lite stykke Norge” – a small piece of Norway. Milk chocolate mousse and blueberry ice cream. So tasty. I could have done without the fluffy, green spunge cakes, but I guess they represented moss on the plate. Once again, we were in Vika to catch a movie at the cinema. This time we saw Woody Allen’s “Café Society. I highly recommend that too. “Et lite stykke Norge” – a small piece of Norway. Milk chocolate mousse and blueberry ice cream. Have you been to Ett Bord? I would love to hear about your experience. Please share in a comment below. This was a sponsored invitation by Ett Bord. The restaurant had no influence on the content of this article, there is no form of cooperation between us, I was not obliged to publish anything, and I received no monetary payment. Unusual, but charming! We were five of our family getting there, came to know an italian couple and a cool lady who had visited Lofoten, and so on. The food was excellent and the hosts very friendly. Hope they will last long on Vikaterrassen. Unfortunately our experience was let down by slow service and food lacking contrast. In particular soft lukewarm squid in beurre blanc with caviar of Kalix (løyrom) was hard to swallow for most of the diners. A slightly livery duck breast was better, but again only soft textures. For 3 courses lunch we waited almost 3 hours. No low calorie drinks (non alcoholic beer, Diet Coke, etc) besides water were available, bread cold, toilet outside the restaurant. Will not return. Sorry to hear about your bad experience. I’ve only heard positive things from others besides this. Hopefully, it was a bad night. The property owner should have fixed the problem with the toilets being outside the restaurant when they refurbished the whole area. I agree, it’s weird that they didn’t prioritize that.